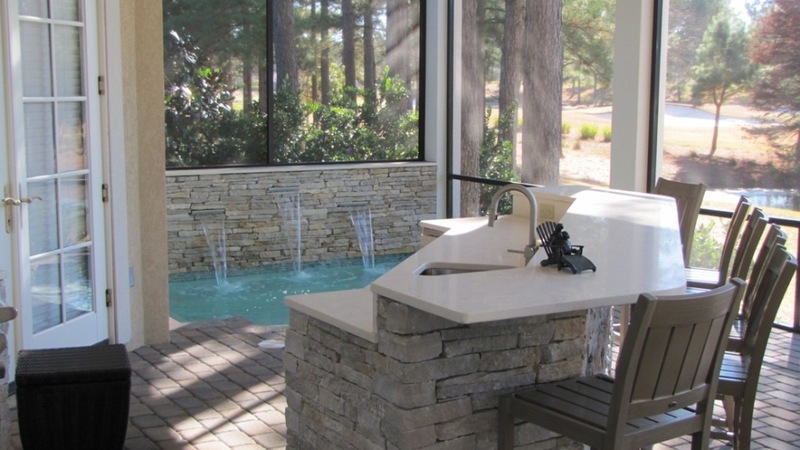 Camp Pool Builders offers custom different pool lines, each type of pool has varying construction practices and timelines. Below you will find an estimated timeline for each type of construction. Click on the pictures below to see enlarged photographs of each type of construction so you will know what to expect when we start your project. The below timelines are estimated in our favor. There is a chance your project can be completed in less time! Custom Fiberglass Pools are manufactured with 26 years experience in design and manufacturing, and delivered right to your door. As the pool fills, the plumbing is run, equipment is set, and the pool is backfilled. Once the pool is full, the tile is set and the deck is installed. Our Custom Fiberglass Pools have pre-set designs. 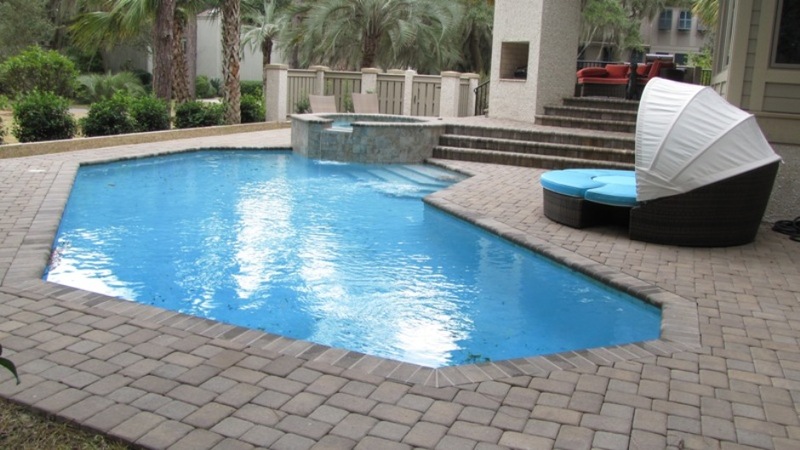 Customize your pool by selecting your depth profile, personalized liner, and coping & decking material. Like fiberglass, these pools do harbor algae growth. Having a non-porous surface leads to less chemical and electricity usage during the season. The need to replace the liner allows for change in the future, and costs less to replace than re-plastering. The long term cost of owning these pools is mid-range. 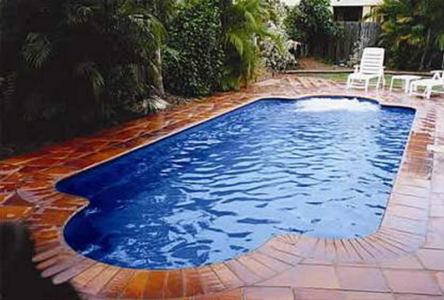 Custom Fiberglass Pools have a low cost of construction. Fiberglass pools are for families who want a pool, but maybe their property values don’t warranty the larger investment. 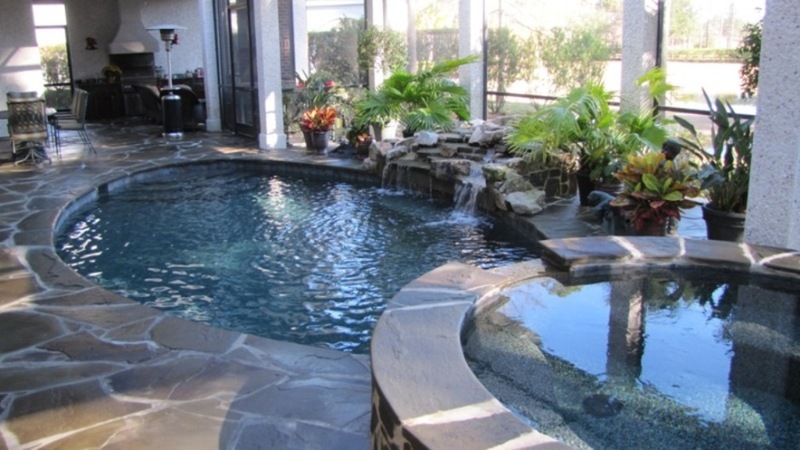 Fiberglass Pools are a perfect fit for a first pool owner in a younger community. It takes 2-3 weeks to install ourCustom Fiberglass Pool Line. Embrace your creativity by designing your own Tailored Shotcrete Pool, constructed of 4000 PSI Shotcrete. The Shotcrete is blasted into place by craftsmen who cut & finish the interior to match your pool specifications. After placing the plumbing lines, setting the tile, coping & equipment, the deck is completed and you’re ready for plaster. Our Shotcrete pools have options such as integrated spas, raised walls, tanning ledges, and water features. Shotcrete pools can be built to any size, shape, and depth profile. If space is an issue, these pools can be designed to maximize your area. Further customize the shotcrete pool by selecting your personalized tile, interior finish color & material, and coping & decking material. Shotcrete pools have the most expensive initial cost of construction. The need to re-surface the shotcrete pool allows for change in the future. The re-surface cost combined with higher chemical & electrical costs gives this line the highest long term cost of ownership. Our clients who are accustomed to being completely tailored to, normally find that shotcrete pools fit them best. It takes 6-8 weeks to build our tailored shotcrete pool. 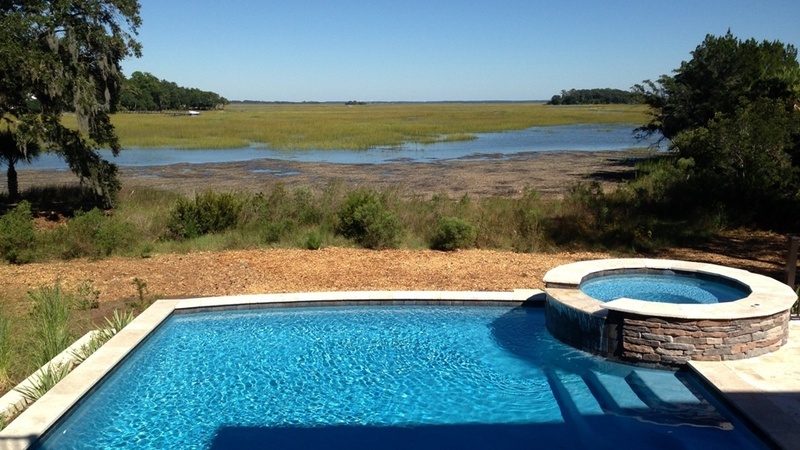 Contact Kevin Camp at (843) 683-2862 or email: Kevin@CampPoolBuildersLLC.com or fill out the form to the right for a face to face meeting and property evaluation to help determine which type of pool will best suit your need.